Things You Shouldn’t Say is an over-the-top-drag musical revue filled with outlandish camp (and boas!) and biting political satire. As the era of Trumpism descends upon us, America’s Favorite Dragapella® Beautyshop Quartet responds with their sharp wit, fierce comedy, hilarious songs, and of course, ends with a kick-line! Having performed in Las Vegas, Off-Broadway and seen on televisions in shows like RuPaul’s Drag Race and ABC’s The Gong Show, The Kinsey Sicks return to the place where it all started, San Francisco, for a limited three run performance! This historic occasion also marks the final performances of founding member, Benjamin Schatz, the group’s loveably unboundaried Rachael. 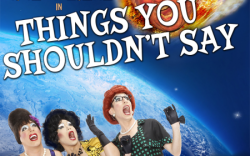 Embarking upon 25 years of San Francisco drag tradition, Things You Shouldn’t Say is an outrageous romp celebrating the history of a group of friends who came together over their mutual love for Bette Midler and ended up creating a world-wide phenomena known as The Kinsey Sicks. Limited Run! Three Performances Only!!! Please Note: Tickets are priced dynamically (airline pricing). Prices go up as they sell out and get closer to the performance date. Purchase earlytor the most savings. Groups of 12 or more enjoy a 20% off discount!